The Chukar Geologic trail is located in the Gunnison Gorge National Conservation and Wilderness Area near Olathe, Colorado. The trail is listed as a Wilderness Area trail on the official brochure that the BLM has published. At the time of this posting the trail had not as yet been marked. We received details about the trail from a ranger that we spoke with while hiking the Chukar trail and decided to hike it while we were in the area. Getting to the trailhead requires a high clearance vehicle. It is recommended that it be a 4-wheel drive. The Chukar road is open to ATV's, dirt bikes and mountain bikes which could also be used to get to the trailhead. To get to the Chukar Road take the turnoff for the Falcon Road 1 mile south of the Olathe stoplight on Highway 50. Follow the paved Falcon Road for 3.7 miles where it becomes the Peach Valley Road and turns to gravel. Continue on the Peach Valley Road for 1.6 miles and turn right onto the Chuckar Road at the sign shown in the above photo. The Chukar Road is 7 miles long and ends at the Chukar trailhead. The parking area for the Chukar Geologic trail is on the right a short distance before the Chukar trailhead. At the time of this posting there weren't any signs for the Chukar Geologic trail but the parking area with its gravel pad and pipe wheel bumpers are obvious to all passerby's. 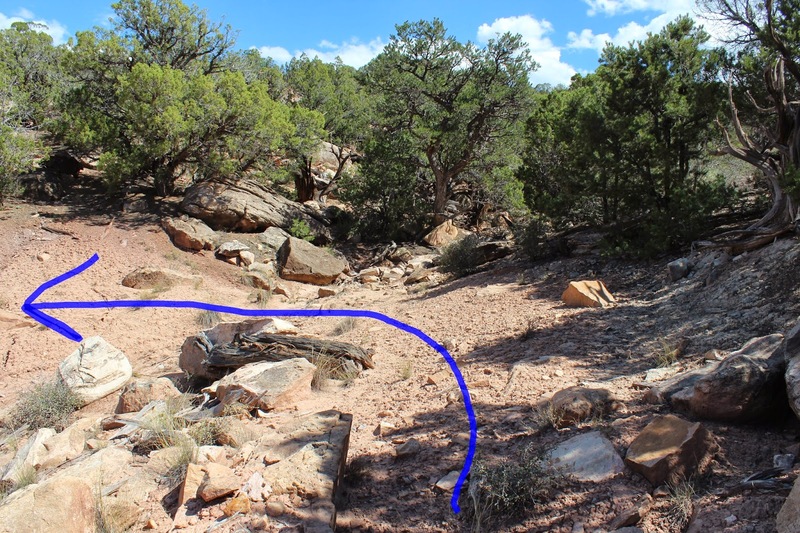 There isn't a fee box at this trailhead but since the trail is on the list of Wilderness Area trails we are thinking that it is still required. A fee box, restroom and picnic area can be found at the Chukar trailhead. The very faint trail travels southeast as it leaves the parking area. Stay on the right side of the draw until the trail crosses the shallow end of the draw and forward progress would be hindered by the trees. The trail begins climbing at this point following a very old jeep road. This jeep trail shows up on some old maps and GPS software. As the trail climbs the mountain it crosses the boundary for the Black Canyon of the Gunnison National Park. Large and small chunks of red, yellow and black agate cover the ground over a large portion of the hillside. Chert can also be found almost the full length of the trail. At this location these rocks are called leaverite which means you have to leave them right here. You can't take any specimens with you because rock collecting isn't allowed in National Parks and Wilderness Areas. From the top of the ridge there are striking views of the Black Canyon where the cliffs become higher and more vertical. Green Mountain can be seen across the gorge in the North Section of the Black Canyon of the Gunnison National Park. The Gunnison River passes through the Blue Mesa, Morrow Point, and Crystal Reservoirs before flowing through the National Park. The reservoirs keep the river virtually free of sediments giving the water its typical clean look. Eventually the river comes to the Smith Fork and North Fork tributaries that bring in heavy amounts of sediments during periods of high runoff. By the time we returned to the trailhead there were enough cairns along the route to make it easier to follow until the trail is officially marked by the BLM and Parks Service. It is probably difficult to allocate funds for a trail where the number of users is hard to predict. We enjoyed the hike and had fun looking at all of the chert and agate. Once at the top of the ridge we could see other places we had been like the North Vista trail that climbs Green Mountain in the North Section of the Black Canyon of the Gunnison National Park. If you would like to see it for yourself then all you have to do is 'Take a hike'.